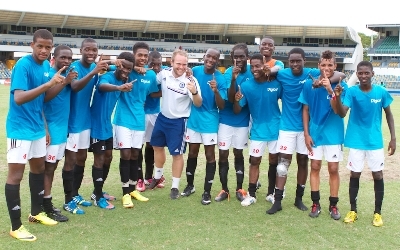 The best young footballing talent from 12 countries across the Caribbean and Central America completed the 2013 Digicel Academy held at the Kensington Oval in Barbados. Teams comprising players from Antigua and Barbuda, Barbados, Bermuda, Grenada, Haiti, Jamaica, Panama, St. Kitts and Nevis, St. Lucia, St. Vincent and the Grenadines, Suriname and Trinidad and Tobago featured in a dramatic final which was won by the Digicel Academy’s Team Lampard. An awards ceremony closed the week of activities in which the aspiring young footballers were put through their paces by the Chelsea FC Foundation coaches. The final day saw the top two teams playing in the final match between the Barbados National U–17 team and the Digicel Academy’s Team Lampard — named after English national player and Chelsea FC central midfielder, Frank Lampard. In the end, Team Lampard emerged victorious and the boys were awarded their championship trophy while the runners-up received medals for their effort. Digicel Academy Head Coach, David Monk, was very impressed with this year’s group of players, saying; “I would like to congratulate the winners of this year’s round robin tournament and the boys who attended the Digicel Academy. This group of players have raised the bar in how they combine their natural talent with the techniques and strategies that they learned at the Academy — which we saw being demonstrated during the 3–v–3 tournament and in today’s round robin final. The Digicel Kick Start Clinics programme is a once in a lifetime opportunity for the hundreds of aspiring young footballers. These players are not only taught skills and technical ability but also an ethos of professionalism and a good attitude – critical attributes of successful people in all walks of life. Now in their sixth year, the Clinics saw hundreds of aspiring young footballers from across 11 countries in the Caribbean and Central America try out for their chance to travel to the Digicel Academy. During the Clinics, the best players from each country trained under the coaches in the hope of being one of the top four chosen by them to go to the Digicel Academy in Barbados to represent their country. 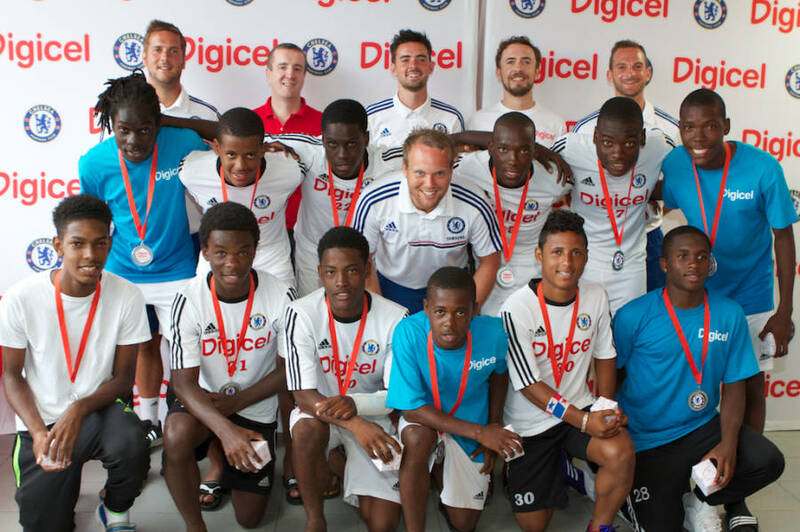 During the week-long Digicel Academy, the top 39 boys from across the region get the chance of a lifetime to receive intensive training under coaches from Barclays Premier League side, Chelsea Football Club. FIFA: Football colonialism in the Caribbean Football Union Region?